Only one like it in the whole wide world… Great for gift giving, for home or office.. 16 x 12 x 3/4 inches. 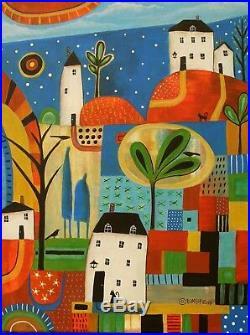 Beautiful Original PAINTING – ACRYLIC on STRETCHED CANVAS. Staple-free sides are painted black. Comes with a signed/titled/dated Certificate of Authenticity. Art piece is signed/dated on front and signed/titled/dated on back. You are dealing with Karla Gerard, Folk Art Abstract Artist. Over 4,000 of my original paintings are in WORLDWIDE collections. It is illegal to use my digital images, copy, reproduce or make derivative (imitated) works from it. Wait for a combined invoice to pay altogether. The item “Away 12×16 ORIGINAL CANVAS PAINTING cats birds ABSTRACT FOLK ART Karla Gerard” is in sale since Friday, March 1, 2019. This item is in the category “Art\Folk Art & Indigenous Art”. The seller is “karlagerard” and is located in Waterville, Maine. This item can be shipped worldwide.